One of the heaviest structured, biggest legged exotic boars we have seen in the last several years. 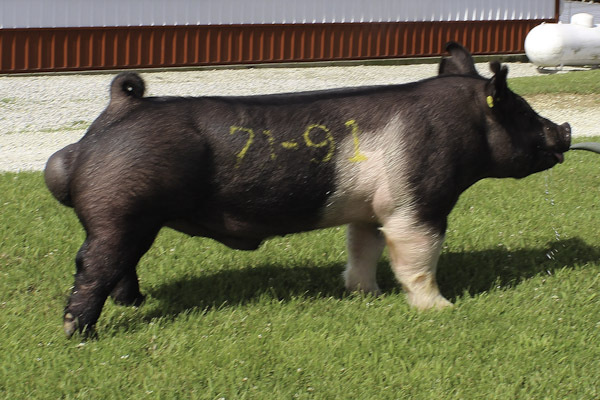 This guy is bred to be and looks like a tremendous showpig sire. Study the size of his bone, study the heaviness of structure. He is big footed and flat boned. He is long hipped and long necked with lots of width and power. Power Lift hits the ground square off of both ends. This guy is Exciting! His Grandfathers on both sides have had explosive runs in the showpig industry. His dam was a power house at the 2017 WPX after being named champion at Jackpot and County Fairs in Texas. Power Lift will be a lot of fun to use. He has the power to make change fast. Lots more bone and structure with lots of eye appeal on a great set of wheels.